Canada Photo ID Printers | Photo ID | Enterprise Time Recording Solutions Inc.
Enterprise Time Recording Solutions Inc. guarantees a smart and cost-effective way to enhance interaction between employees and managers while maintaining security. As a photo ID provider, we have both stand-alone and integrated solutions to implement and maintain a photo identification program. This smart solution delivers reliable performance, high quality results, and the ultimate in user convenience. 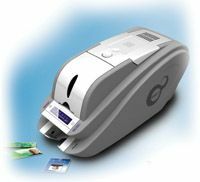 The Stand-Alone Photo ID System comes bundled with free design software for smart designs, making it quick and easy to use.  Download the Stand-Alone Photo ID System brochure (PDF). 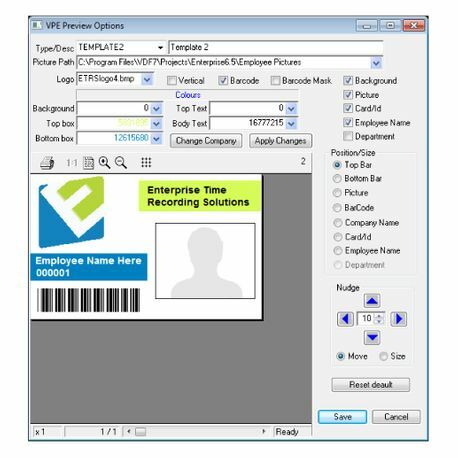 With the Photo ID Module, you can easily design and print employee badges directly from our Enterprise Suite Software Solution. Adding photo ID to employee badges has proven to reduce misidentification and increase security. The module is designed with you in mind. In a few minutes you can create your own photo ID badges by transferring ID data, such as names, employee numbers, and departments into a computer, and include a photo from a digital camera. 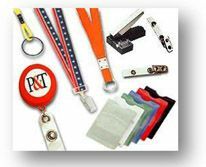 The badging software then combines an organization’s logo, photo and ID data in a customer-specified badge format. Cardholder data is stored in a PC or file server database, which can be used to develop security reports.  Download the Photo ID Module brochure (PDF). To place an order, simply call Enterprise Time Recording Solutions Inc. today at 1-877-660-8463 (TIME).